When it comes to its relations with former Soviet republics in the Caucasus, Moscow has a delicate balancing act to play. It’s virtually impossible for Russia to play the role of a mediator in the Armenia-Azerbaijan conflict over Karabakh, but at the same time, Moscow doesn’t want the latter to move closer to Turkey. Russia-Georgia relations are hostage to the status of Abkhazia and South Ossetia. RIR evaluates Russia’s relationship with the Southern Caucasian states. Baku has long demonstrated its equidistance from all integrative projects, limiting membership to participation in the amorphous CIS and the Cooperation Council of Turkic-Speaking States (CCTS or Turkic Council). But then again, the only projects being implemented in the latter are primarily humanitarian ones not requiring large sacrifices. One can only guess how Azerbaijan will behave if the alliance starts putting its economic components into action. Baku’s disinterest in interstate alliances can be explained by its strict unwillingness to live in conditions where it would have to take “multilateral interests” into account, as these usually lead to some infringements on its own sovereignty. President Ilham Aliyev has clearly stated that Azerbaijan is not interested in European integration and the European path is not the one for his country. At the same time, Baku is prepared to develop and deepen bilateral relations in conditions of equal partnership with virtually anyone. Because of the problem in Karabakh, Azerbaijan is forced at times to act with an eye on Russia and avoid making any sharp “movements” in Russia’s direction. Other constraints may include the Russian market, in which a large part of Azerbaijani agricultural products have traditionally been sold, and the large number – at least a million – of migrant workers in Russia. These factors can be considered as Moscow’s levers of influence over Baku. Experts are inclined to think that Azerbaijan’s interest in international alliances depends in inverse proportion on the volume of energy harvested. That is to say as soon as a decline is noted in the oil and gas production industries, which, based on a number of prognoses could happen by 2020, this will reflect accordingly in the self-sufficiency of the Azerbaijani state, which might begin to look interestedly into multilateral unions. 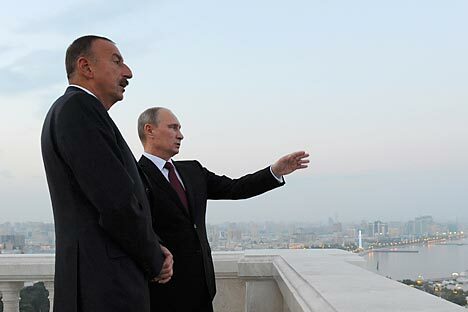 Russia would of course like to see Azerbaijan in the Eurasian Economic Community (EAEC), but it cannot understand why any sort of pressure on Baku just pushes it into ever tighter ties with Ankara and why tough actions only alienate Azerbaijan as a potential partner. All the same, bilateral relations between Russia and Azerbaijan can be fully considered as warm and friendly. Despite many predictions, they were not even soured by Azerbaijan’s refusal to extend Russia’s lease on the Gabala Radar Station. Moscow’s influence on Baku may be best described as limited. There are no problems between Yerevan and Moscow. The Armenian leadership’s short-lived vacillations between the EU and the EAEC ended in the selection of the pro-Russian alliance. In response, Russia provided its strategic partner with security guarantees. If we add to that the fact that Russian capital is ubiquitous throughout virtually the whole Armenian economy, in the very least it is present in its most attractive objects and sectors to a significant degree, then we see that Yerevan is highly, if not completely, dependent on Moscow. The West had related loyally to Armenia’s multi-vector approach to foreign affairs and tilt towards Russia given Armenia’s difficult conditions under the Azerbaijani-Turkish blockade. But after the Armenian government unconditionally supported Russia’s actions in Ukraine, the West let it be made known that it may reconsider its relationship to Yerevan. This means that Russia’s main ally in the South Caucasus could face difficult days in terms of internal stability. The situation here is opposite of that in Armenia, even disregarding the fact that Russian capital is represented in significant volumes. Moscow’s main problem is the virtual absence of a “pro-Russian bridgehead” that it could count on. In recognizing the independence of Abkhazia and South Ossetia, Russia deprived itself of effective leverage over Tbilisi. Reintroducing a trade embargo for the sake of carrying out its goals is regarded as a dubious exercise. First, Russia takes its international image quite seriously, and, second, as experience shows, while the Russian market is of course important for Georgia, its loss is not fatal. Tbilisi has long declared itself a proponent of Western integration. And there was no revision to its external political course with the change of government. Some disappointment with the West is observed in Georgian society itself. The intensification of pro-Russian forces by several NGO’s and NPO’s has also been observed. However, these organizations cannot be said to be shaping public opinion or considered authoritative; not at this stage at any rate. Georgia, like Moldova, is planning to sign an agreement of association with the EU. Given the events in Ukraine and the bitter experience of August 2008, Tbilisi is today trying to calculate the degree of risk associated with Russia. The main threat, in the opinion of local experts, comes from the “occupied territories – Abkhazia and South Ossetia – where provocations are possible in the long-term.” Unpleasant news comes also from Javakheti, a region with an Armenian majority. According to some Georgian reports from the Georgian side, the number of people who have obtained or want to obtain Russian citizenship is growing. This cannot fail to alarm Tbilisi, which has had to deal more than once with the periodically rising levels of separatist sentiment in this region. No less of a concern to the Georgian authorities is the previous government, which does not hide its revanchist plans and has now taken to openly threatening to organize a “Ukrainian Maidan” in Tbilisi.